It's not often a band comes back from a long hiatus with anything approaching its best work, but with Quiet Moments Lycia has returned with a beautiful and blissful release. A few weeks back, Cold, darkwave icon Lycia’s 1996 album, was reissued on vinyl by label Handmade Birds. Its reappearance was a reminder, if you needed one, of Lycia's important role in the realm of ethereal and dark ambient music. Cold is, by any measure, a gothic rock masterwork, and while fans often cite the album as the band's very best work, you could point to 1995's The Burning Circle and then Dust as being equally sublime. Lycia was formed in Arizona in 1988 by Mike VanPortfleet, who was joined at various stages by David Galas, John Fair, and singer Tara VanFlower--although the band is down to the duo (and married couple) of VanPortfleet and VanFlower these days. For the past decade, Lycia has been on hiatus. In a recent interview, VanPortfleet said he'd spent the last ten years feeling like his "time had come and gone" and that "there were times when it seemed as though Lycia was nearly forgotten". In one sense, that's understandable. The kind of bleak, romantic, and esoteric synth and shoegaze that Lycia provided retreated into an infinitely darker corner of the musical spectrum in the '00s. And although Cold and The Burning Circle and then Dust are hallowed albums in solemn rock's music halls, Lycia never sold the millions of albums that the Gothic rock superstars of the '90s did. However, Lycia's influence, and the respect it’s afforded, has been far more profound than any record sales figures would suggest. While VanPortfleet might have felt his band was under-appreciated, you only need look to the resurrection of deathrock, the rise of witchy and hauntological electronica, shoegazing metal, eerily psychedelic Americana, or the rejuvenation of dark ambient music to see that Lycia's legacy inspired a raft of musicians across a broad range of musical genres. 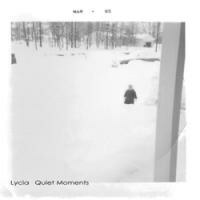 Lycia was never forgotten, and after a decade in the wilderness the band is returning with a brand new album, Quiet Moments. Obviously, that's a celebration for fans, but it also means that Quiet Moments will be measured against what has become a noteworthy legacy for Lycia. The reemergence of a career highpoint like Cold is a reminder of what the band can achieve. Add on the fact that Lycia's reputation has increased in its absence, and you've got a number of elements coming into play with the band's new release. Expectations can and do get a little warped when an influential and much-admired band returns, and you might rightly ask if a new album in 2013 from Lycia can ever really hope to measure up to the band's best work. Well, thankfully, unlike the often lackluster or timid works of other bands coming back from hiatus, Quiet Moments is breathtaking and bewitching, mixing the familiar and expected while still offering something new. Written, performed, and recorded by VanPortfleet, with additional vocals from Vanflower, Quiet Moments is a deeply personal and honest album--and it’s all the more powerful because of that. Lycia's past work was certainly autobiographical, with emotionally raw songs and plenty of mournfulness, but as VanPortfleet has said, Quiet Moments is his most intimate work--offering glimpses into his private life and innermost thoughts. Lycia has taken the symbolism of the changing seasons, bound that to notions of location and nostalgia, and channeled all through a gothic filter for a haunting, heart-rending aesthetic. As a result, Quiet Moments retains the band’s previous hypnotic mood. Delving into isolation, existence, love and loss, the album covers the same eternal themes that Lycia has always explored. Tracks like "Grand Rapids" and "The Pier" capture plaintive snapshots of memories, and while these are VanPortfleet's personal recollections, the symbolism allows you to immerse yourself in Quiet Moments, take the poetic elements from his tale, and make the memories your own. That's always been a key feature of Lycia's allure--its ability to weave stories around felicitous sounds. Musically, while Quiet Moments retains much of Lycia's enchanting signature tone, it's not without its surprises too. Darker psychedelia, a kosmische undercurrent, dissonant washes of noise and low frequency pulses appear alongside the expected stark electronic beats, VanPortfleet's susurrus vocals, and waves of effects-driven guitars, all drenched in the ebb and flow of shimmery keyboards. Of course, creating that moody atmosphere is exactly what Lycia does best--turning the mournful into the majestic to make meditative suites. Certainly, "Antarctica" is simultaneously contemplative and cold, conjuring snow flurrying over desolate landscapes as VanPortfleet sings of his childhood. With echoing vocals rising through wintry drones, and light reflecting off glazed guitars and billowing effects, Quiet Moments does call to mind the glacial grandeur of Cold. "Greenland" finds VanPortfleet looking over "the icy shores of a frozen land", where "the truth is revealed", with a sub-harmonic hum prodding at the bitter bite of isolation, while lush effects and weeping keyboards all wind around treated guitars. "Antarctica" and "Greenland" reaffirm that Lycia can still provide all the chills, along with plenty of yearning imagery, and deep, immersive evocativeness. The scratching hiss running under "The Wind Sings" brings to the fore all the songs lyrical turbulence, set to viewing relationships in better times. "Dead Star, Cold Star" is cosmic electronica awash in metallic noise, while VanPortfleet gazes at the heavens through all the darkened ambience of dusk. Both tracks are deeply expressive, eloquent and meaningful, but surprises also await on Quiet Moments. "Dead Leaves Fall" brings industrial beats and grungier noise to twist around an icy guitar line, accompanied by grim, even vengeful, lyrics. "The Soil is Dead" sits halfway between radio stations, picking up echoes of static bouncing off satellites, while vocals from VanFlower swirl in the mist. However, while both those tracks show VanPortfleet heading into sterner musical territory, "Spring Trees" stands out as the album's most surprising, and in turn beautiful, track. "Spring Trees" seems to be VanPortfleet's and VanFlower's ode to their young son, and unlike much of the forlornness of Lycia's past, the song is bursting with hope. "To see wonder in his eyes / Erases all these troubled thoughts and troubled times / I'll sacrifice me... for we / His happiness seems to be / The beating heart of our family". Lycia has never been as revealing, and with rougher guitars weaving through sanguine psychedelia, and VanPortfleet's voice backed by VanFlower's ethereal echo, it's a track made all the more intoxicating by its openness and elegance. It's not often a band comes back from a long hiatus with anything approaching its best work, but with Quiet Moments Lycia has returned with an album as blissful and fascinating as Cold or The Burning Circle and then Dust. The only thing fans might miss here is VanFlower's voice, which only appears briefly; but then, this is VanPortfleet's tale, and (bar one song with lyrics from VanFlower) these are his reflections. Quiet Moments continues the gothic electro-rock of Lycia's past, but the album requires no reminiscences about the band's legacy to appreciate its strengths. It stands on its own merits, here and now, and while this couldn't be an album from anyone else--because no one else sounds like Lycia--VanPortfleet hasn't tried to compete or capture anything from Cold or The Burning Circle and then Dust. He's made an album that's an honest representation of where he sits today as a songwriter, and in doing so, Quiet Moments is yet another step in the band's creative evolution. Quiet Moments presents a beautiful portrait of Lycia in 2013, reaching in and grasping at the heart with bittersweet, pensive, and luxurious sounds. Lycia has provided some achingly blissful suites in the past, and Quiet Moments ranks up there with its very best work.